North Cyprus Blog: Which North Cyprus hotel do you think is best? One question fills me with dread when friends ask me about North Cyprus; "Which hotel do you think is best?" Of course, the problem is, living here, I never stay in any! Most of my 'recommendations' come from friends of friends, or the experiences of my rather picky relatives. So, when good friends, Guy and Sue, announced they were coming to visit at short notice, it was with some relief that they said they had already booked the Savoy Ottoman hotel via the Internet, because it had good reviews. And when they invited me to join them for dinner at the hotel, I couldn't help but want a nosey look around too! The Savoy Ottoman is one of those hotels that I've gone past several times, but never stepped inside, and I was pleasantly surprised. Yes, it's all gold leaf on the ceilings and marble and gleaming surfaces, but in a 'this is a nice smart hotel' sort of way, not the usual brash 'let's be having your money then' feel! A quick peek out the back revealed a nice swimming pool overlooked by balconied rooms, and plenty of room to toast yourself on the poolside terraces, a must-do for most sun-starved European tourists it seems! My friends' room was stylish and nicely decorated, and remarkably quiet for a central Kyrenia location, I thought. Sue said the bed was very comfy, although decorum prevented me from trying it out myself! 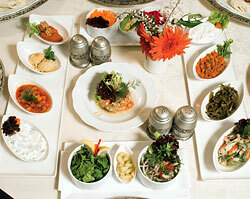 We ate in the Ottoman/Lebanese Sarayburnu Restaurant and I must say both food and service were excellent. It was a quiet night when we went, admittedly, but the staff were very attentive and smiling, a nice change from some "5 star" places I've ate at during my years here! Guy treated us to a bottle of very good French wine, which to me looked rather expensive but tasted divine with the chef's chocolate dessert! The bill was, shall we say, on the high side for North Cyprus but no more than Guy reckoned he would expect to pay in London for an OK meal in an OK place, not a swanky hotel. Sue had tried the spa centre and voted the Turkish bath/sauna/steam bath experience as "Bliss", and Guy gave a thumbs up to the bar staff at the hotel's two bars. They had also been presented with a welcome drink of ‘gul suyu’ - which for our non-TRNC readers is a refreshing drink that is made from roses, and tastes like a cross between hibiscus tea and traditional British rosewater syrup you use on cooking, a nice touch. Guy and Sue were thrilled with the hotel, loved North Cyprus (they enjoy walking deserted beaches, drinking beer and exploring ancient sites, not necessarily in that order), and best of all, didn't even start to expect me to house, feed and entertain them for free. Thanks Guy and Sue (and the Savoy Ottoman) - see you again next year! This web page is served on 20 April 2019 at 00:07:57.